Starting from the Creators Update, new Microsoft Fluent Design effects have been introduced for the first time in Windows 10, or any Windows OS for that matter. New transparency and illuminations effects that now form an overall Microsoft Fluent Design System on Windows 10 are meant to add a new dimension to the Windows experience. However, if new transparent effects don’t appeal to you, then use instructions in this guide to disable fluent design effects on Windows 10 and learn how to manage Fluent Design System on the Windows devices. One thing to note that this fluent design mechanism will be introduced in the Windows 10 Fall Creators Update, so if you don’t see it now this is because the update hasn’t been released for public yet and is only available to enthusiasts registered with the Windows Insider program. However, once the update start rolling out, sometime in the next couple of months, you will notice plenty of visual changes on Windows 10, including a new type of transparency with blur and noise texture in the Start menu, Action Center, task bar, apps and default windows programs. These visual elements will be visible whenever you open and navigate apps that support new illumination effects. This is done to promote interactive interaction with the Windows apps. You can illuminate certain parts of the program or app to make them stand out from the other elements. It also increases the visibility of the parts of the app that have new light effect set for them. 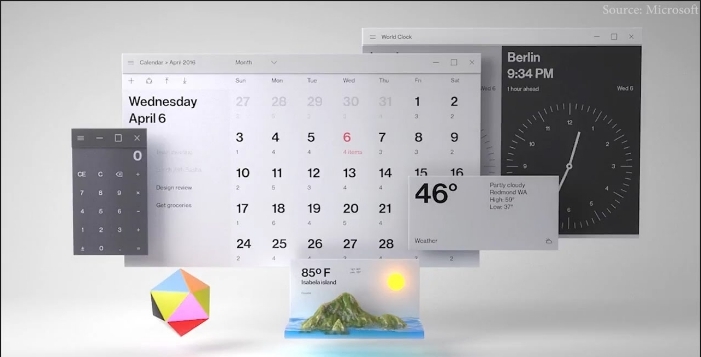 Microsoft has named these visual changes as Acrylic Material and Reveal Highlight. Together, they make up a part of the overall Microsoft Fluent Design System, which is an all new design language whose main purpose is to shift from the traditional flat design to a new system that makes apps more immersive and engaging for Windows 10 users. However, there is always going to a case when these new design changes won’t appeal to everyone. 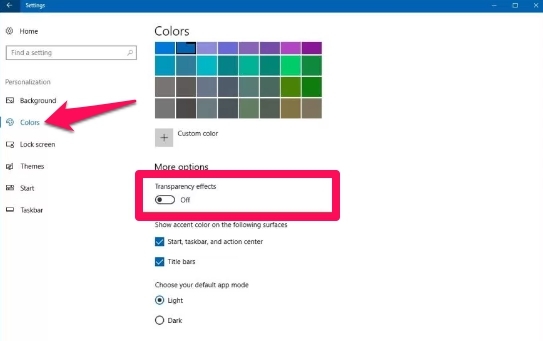 It these new visual effects to attract you, or they are draining battery of your laptop or tablet, you can disable them from the Settings app. In step-by-step guide below, you can learn the method to disable Acrylic Material and Reveal Highlight parts of Fluent Design on Windows 10 running the Fall Creators update or later. 2 – Click on Personalization. 3 – Click on Colors on the left-pane of Settings window. 4 – Disable the Transparency effects by turning the toggle to off position. 5 – All done. Exit the Settings app. Once you have disable the fluent effects, you won’t see Acrylic Material and Reveal Highlight effects on Windows 10 and apps like Maps, Groove Music, Calendar, Calculator, and other default Window applications and programs. Please note that the new design system has various elements, some can’t be simply turned off as they form guidelines for developers, other reason is that some elements are an integral part of Windows 10 and apps, including perceptive parallax, connected animations, and conscious scrollbar. Hopefully this guide was helpful to you, leave comments below for feedback and direct further questions that you may have for us.